1. Heat oil in a medium saucepan. Add carrots, bell peppers, onion, and garlic, and cook for 10 minutes over medium heat, stirring occasionally until the vegetables are soft. 2. Add cumin, black pepper, red chili powder, salt, and lime juice. Cook for 2 minutes and then add the vegetable broth; simmer for 10 minutes. Turn off heat. 3. Allow the mixture to cool. In a blender fitted with a steel blade or a food processor, puree the mixture in batches as coarse or fine as you prefer. 4. 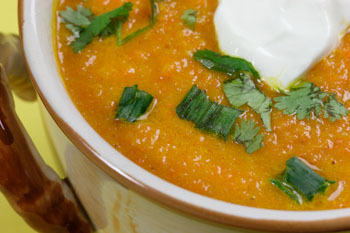 Transfer puree to soup bowls and garnish with cilantro, scallions, and dollop of sour cream. Sweet carrots and bell peppers add a lovely, vibrant color and flavor, with the cumin and red chili powder spicing it up. This soup can also be served chilled on a hot summer day.